While there are reasons for continued optimism about the economy and the stock market, there are also potential warning signs of tougher times ahead, including an inverted yield curve and. The current economic environment presents challenges for investors trying to manage their portfolios. Portfolio hedging can become part of your long-term investment strategy or applied and removed as needed to help provide short-term shelter from adverse market events. Optimism about trade talks and a dovish stance from the Fed have boosted equity markets so far this year. The S&P 500 returned 13.1% in the first quarter, the strongest quarterly gain since 2009. While there are reasons for continued optimism about the economy and the stock market, there are also potential warning signs of tougher times ahead. Most recently, attention has been focused on signals from the U.S. bond market―specifically the inverted yield curve. But there are warning signs from abroad as well, especially from Germany. With recessionary talks increasing, having a flexible investment strategy is critically important. Hedging strategies can be a valuable part of that toolbox. 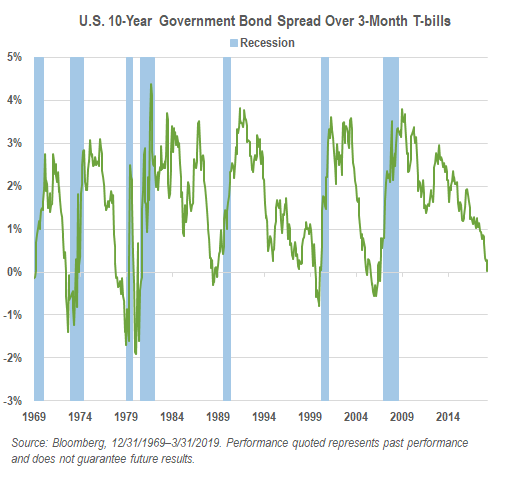 An inverted yield curve has historically been a strong indicator of an economic slowdown. The past seven U.S. recessions, dating back to 1970, have been preceded by an inverted yield curve. 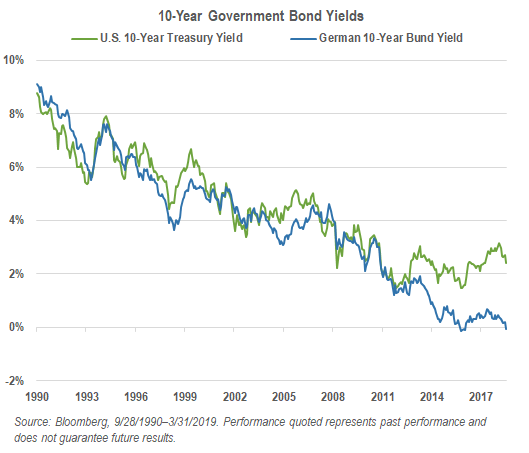 The yield curve has flattened significantly over the past few years as the Fed has raised rates, and recently the U.S. 10-year Treasury yields fell below three-month yields. In addition, the Fed has signaled no rate increases for 2019 and has announced that it would cease its balance sheet roll-off plan by September. But this does not necessarily mean a recession is right around the corner. The bond market has been unusually distorted by quantitative easing (QE), making interpretation of the yield curve challenging. Outside the U.S., Europe is sending its own warning signs. While it appears that the Fed may be finished raising rates, the European Central Bank (ECB) has yet to get started. The ECB still expects rates to remain unchanged throughout 2019. Growth forecasts for the euro zone were recently cut to 1.1%, down from 1.7% in December. As China’s growth has slowed on the back of trade tensions, weakened global trade has negatively impacted the euro zone, and Germany in particular. German 10-year Bund yields remain stubbornly low, hovering right around 0%. There have been some hints at recent optimism for trade deals between the U.S. and China, and these deals could come at an important time. The current economic environment presents challenges for investors trying to manage their portfolios. Timing the market can be challenging, especially during bouts of volatility. You might find yourself selling in a down market, only to see a sharp rebound, such as what we saw from Q4 2018 to Q1 2019. And given this bull market is now 10 years old, investors may not want to sell large equity positions and potentially incur capital gains taxes. Moving to bonds has historically been effective, but with yields already so low, this option may be less appealing. Hedging with inverse ETFs is a flexible strategy that can be invaluable during an uncertain market environment. Inverse ETFs, which have been in existence for over 10 years, are designed to move in the opposite direction of their benchmark (e.g., -1x), on a daily basis (before fees and expenses). The universe of inverse ETFs has expanded greatly over the years, and there are now inverse ETFs covering major benchmarks in equities, fixed income, currencies and commodities. 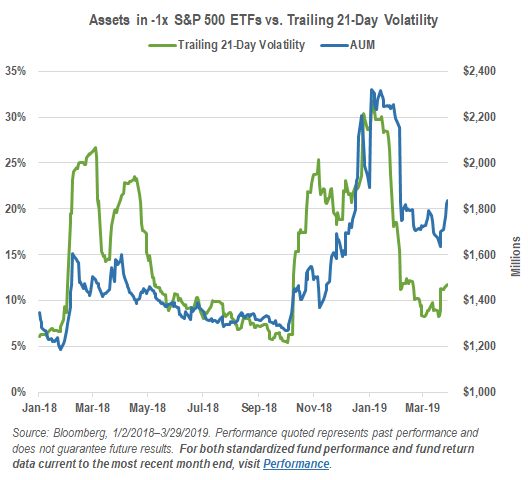 The graph below shows assets in -1x S&P 500 ETFs versus trailing 21-day volatility, from January 2018 through March 2019. You’ll notice that assets tended to mirror the volatility environment. When markets became more volatile, assets in these inverse ETFs tended to increase, suggesting that investors may be using the tool as a tactical hedge. Understanding that inverse ETFs have a daily objective is important―at the end of each day, portfolio management teams may buy or sell underlying investments in the funds to realign the funds’ target level of exposure to their benchmarks. For holding periods beyond a day, accumulated gains or losses will compound over time. Generally speaking, compounding can enhance returns during trending periods, but potentially hurt returns in volatile periods, especially range-bound periods. Investors looking to hold inverse funds for longer periods of time and maintain consistent exposure to the fund’s benchmark, as a hedge for example, can employ a rebalancing strategy. Rebalancing requires investors to increase or decrease their position in an investment at predetermined intervals to maintain their desired level of exposure to the investment’s benchmark. For example, an investor may choose to rebalance every time an investment’s return and the return of its underlying benchmark reaches a 10% gap. This is referred to as trigger-based rebalancing. Before committing to a rebalancing strategy, investors should evaluate the potential benefits against likely transaction costs and tax consequences. Additionally, investors should have capital available for when the rebalancing strategy requires them to buy additional shares to increase their exposure. And most importantly, investors should monitor their positions as frequently as daily. Consider the chart below, which compares a buy and hold (un-rebalanced) and rebalanced -1x S&P 500 position versus the S&P 500 over time. The S&P 500 returned -3.69% during this choppy period, while the buy and hold -1x S&P 500 position returned -0.83%. It did better than the S&P 500 but not as well as the rebalanced position, which closely mirrored the S&P 500 throughout the period and ended at 3.82% compared to -3.69%. However, there were a few days in the beginning of August, while the S&P 500 was clearly trending up, when the buy and hold position was the better performer. It is important to understand that rebalancing can buffer the negative effects of compounding, but it can also reduce the positive effects, depending on the market environment. Hedging with inverse ETFs is a flexible strategy. You can apply it broadly in an effort to help reduce loss across entire asset classes in your portfolio, to help shield your equity, fixed income, commodity or even currency allocations. Or you can hedge narrowly to help shield individual sectors or even specific stocks. 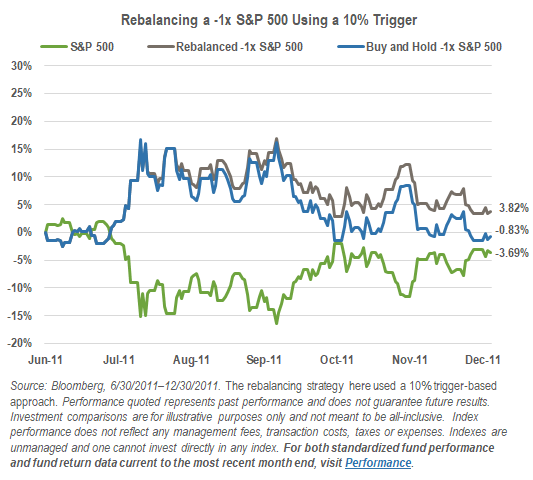 Used strategically, portfolio hedging can become part of your long-term investment strategy. Deployed tactically, a hedge can be applied and removed as needed, without disturbing your core strategy or long-term goals, to help provide short-term shelter from adverse market events. Of course, hedging strategies have unique risks, costs and consequences of their own (i.e., fund management fees, rebalancing costs, taxable events, etc.). It’s important that you fully understand the strategy you plan to use and read the prospectuses for any investments you intend to use as a hedge. Investing involves risk, including the possible loss of principal. Most leveraged and inverse funds seek returns that are a multiple of (e.g., 2x or -2x) the return of a benchmark (target) for a single day, as measured from one NAV calculation to the next. Due to the compounding of daily returns, leveraged and inverse fund returns over periods other than one day will likely differ in amount and possibly direction from the target return for the same period. These effects may be more pronounced in funds with larger or inverse multiples and in funds with volatile benchmarks. Investors should monitor their holdings as frequently as daily. Most leveraged and inverse funds are non-diversified and each entails certain risks, which may include risk associated with the use of derivatives (swap agreements, futures contracts and similar instruments), imperfect benchmark correlation, leverage and market price variance, all of which can increase volatility and decrease performance. Inverse funds should lose money when their benchmarks or indexes rise. Please see their summary and full prospectuses for a more complete description of risks. Carefully consider the investment objectives, risks, charges and expenses of ProShares before investing. This and other information can be found in their summary and full prospectuses. Read them carefully before investing. There is no guarantee any ProShares ETF will achieve its investment objective. Shares of any ETF are generally bought and sold at market price (not NAV) and are not individually redeemed from the fund. Brokerage commissions will reduce returns.ProShares are distributed by SEI Investments Distribution Co., which is not affiliated with the funds' advisor or sponsor. Additional disclosure: Leks Gerlak has been an Investment Strategist with ProShares since 2015. His responsibilities include portfolio analysis, education, product research and development, and the presentation of investment strategies using the company’s leveraged and inverse (tactical) ETFs. This information is not meant to be investment advice.